An election worker walks past a voter identification sign at a Little Rock, Arkansas, polling place in May. Voter access has been a hot topic recently. Earlier this month, the Supreme Court upheld a Texas law passed in 2011 that requires voters to present photo identification when casting their ballots. It may seem like voter access has only become an issue in the past two years, but the numbers show that the current debate is part of a longer trend toward more restrictive laws. 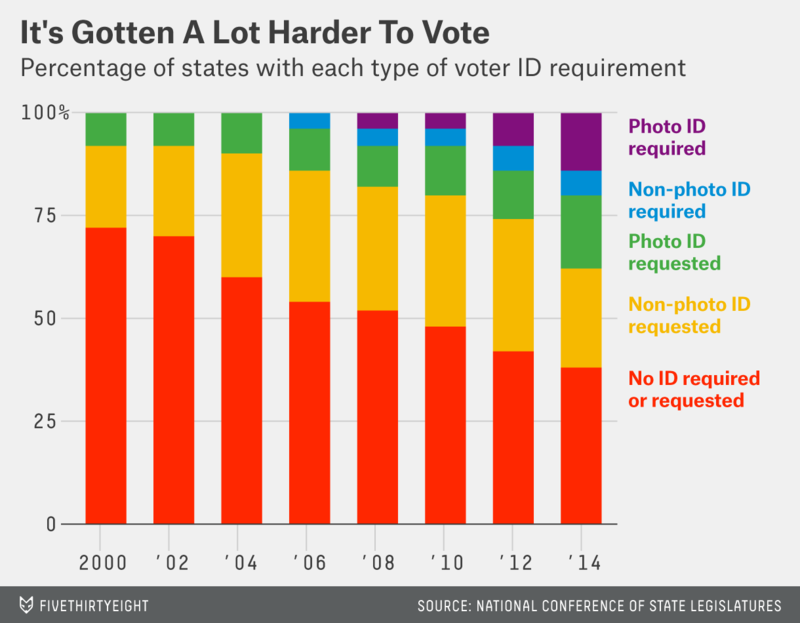 Some states have had ballot initiatives requiring voters to present some form of ID, and those initiatives were subsequently voted down. Many proposals didn’t even make it that far. So will this trend continue? Or is the tide changing? The answer is … complicated. The number of states with proposals to loosen voter ID requirements seems to be experiencing a slight upward tick, while the percentage of those that made it on the ballot is growing — 22 percent in 2012, up to 46 percent this year. Then there are the courts, where results are mixed. The Supreme Courts in Pennsylvania and Arkansas have struck down more restrictive voter ID laws this year. While the U.S. Supreme Court has held that such laws in Indiana and Texas are constitutional. A battle in Wisconsin was put on hold this month, when the U.S. Supreme Court blocked the law from being implemented for this year’s election but left room for its implementation in the future. 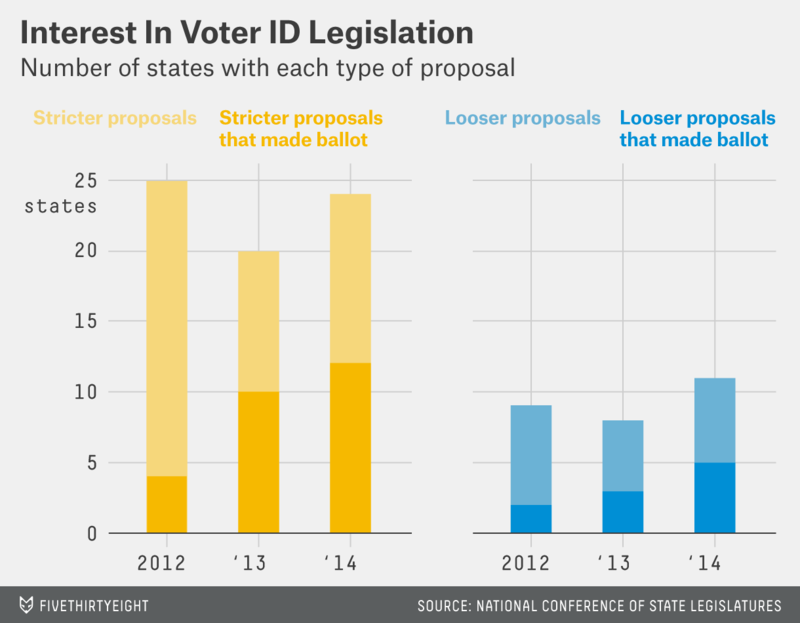 As the number of states with some kind of voter ID requirement grows, there will (theoretically) be a decrease in proposed legislation for stricter standards. The real question is whether the increase in proposals for loosened standards will continue, and whether those proposals will be implemented.